Chesapeake leased an additional 40,000 acres since March 31, 2009 and now has 623,000 gross/510,000 net acres. 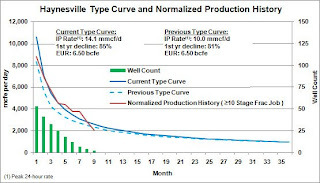 Chesapeake wells are currently producing 285 MMcf/day (gross)/175 MMcf/day (net); expected to rise to 575 MMcf/day (gross)/275 MMcf/day (net) by year-end 2009 and 1.025 Bcf/day (gross)/575 MMcf/day (net) by year-end 2010. The company has completed a total of 74 horizontal wells in the Haynesville Play. The company currently operates 29 rigs in the play and will increase rig count to 33 by year end and 36 in 2010. Chesapeake also provided a revised type curve on which the company is basing projected well economics. They kept the 6.5 estimated ultimate recovery factor (EUR), but because of higher initial production rates have increased the front end of the curve. While the graphic change is slight, the importance of this change is that the present value (upon which investment decisions are based) is enhanced because more cash is realized in the beginning. In a world where time is money, it is far better to get the money on the front end. The type curve below is based on data from 56 horizontal wells that were completed with ten or more fracture stimulation stages. Chesapeake seems to have found its special sauce after much experimentation. Chesapeake Royalty LLC 30 H-1, De Soto Parish, LA, commenced production 2/27/09: 15.2 MMcf/day 30 day rate; achieved a pipeline-constrained peak rate of 22.6 MMcf/day. The release used the phrase "pipeline-constrained" five times when talking about the above wells. I'm waiting for these companies to bring in extra pressure gauges for completion jobs to continue the "peak rate arms race" over the next year. Who will be the first to boast of a well greater than 30 MMcf/day? Questar joked about it in their conference call earlier this week. Place your bets! Maybe I should set up a pool to guess who and when.